Phillips Auction House in New York City has partnered with Tumblr to create the world&apos;s first digital art auction. 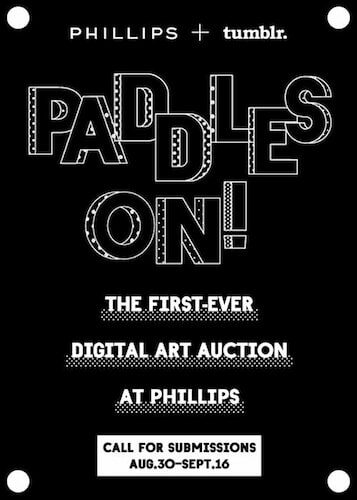 Entitled "Paddle On," the auction will take place both online and at the gallery in New York. There is currently a call for submissions that has been sent out to the Tumblr art community, asking for GIFs, video clips, and various other digital arts for the auction. Similar to this year&apos;s ICP Trienniel, the auction will acknowledge the tremendous impact that computers have had on art, both in practice and how we attempt to define exactly what "art" is. To submit your own art for consideration, visit http://paddleson.tumblr.com/.